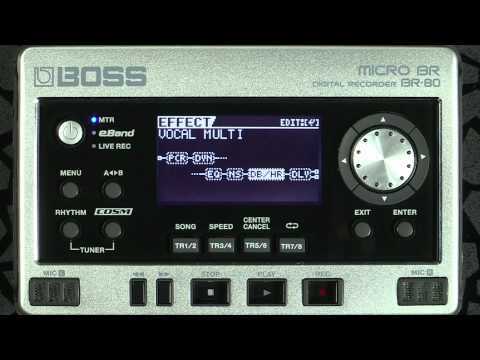 The Boss Micro BR-80 is the ultimate pocket-sized recording tool. On-the-go recording became very popular after the first Micro BR multi-track recorder was released and this updated and improved version builds on it's success. With the Boss Micro BR-80, the track count is doubled (eight playback tracks, 64 virtual tracks) and it includes the most up to date COSM effect system. The Boss BR BR-80 Portable Digital Recorder is a great tool for getting ready for your next big performance. Whether you're a solo musician that wants to have a bit more backing sound, or a full band that just wants to experiment more, the Boss BR-80 is capable of recording any of your ideas beforehand, then playing them live a a backing-track accompaniment. You can really let your creativity loose with the Boss BR BR-80. The world class COSM amps and onboard effects can be a real gamechanger, and provide you with plenty of sounds and effects including guitar, bass and vocals. All your recordings are captured straight to SD/SDHC memory card up to 32Gb. The stereo condenser microphones offer ultra high-quality field recording in an instant. All of these features are so compact that it still retains its tiny dimensions, easily fitting into a pocket for serious portability. Add to this Boss eBand JS-8 virtual backing band playback and you have an amazingly powerful tool for touring musicians. Posted on 30/01/2016 by Luos I bought this because I needed a portable recorder which I could use at home and take with me on holidays. It is packed full of features. The jam tracks are great to jam along with, which also tells you which key to play in which is quite convenient. There are loads of guitar, bass and vocal effects which are great for studio recording. The live recordings are easy to make, some trial and error with positioning of the recorder and levels but once mastered sounds great. The drum track can be tricky to understand at first so read carefully the instructions and follow step by step and you'll get it. The SD card can be used in the car which is cool for singing along to your recorded songs. It really is a brilliant recorder with two condenser microphones built in. Great value for money!